Octave One have long been one of the more prolific techno outfits that came through in the waves of talent from Detroit during the late ’80s to early ’90s. Originally comprised of brothers Lawrence, Lenny and Lynell Burden, their energetic, funk infused style of techno was heralded by their 1990 debut track “I Believe” with Lisa Newberry on vocals. Soon after this they established their own record label 430 West and slowly began releasing the tracks that would make up some twenty single releases, seven albums and countless remixes. Their tracks have always possessed a raw edge, whether it’s the percussive-heavy, spooky tribalism “Night Illusion,” the spare, minimalistic funk of “Art and Soul” or the tense, on-the-wire feeling of “DayStar Rising.” Coupled with a spine tingling fragility present throughout many of their works (and epitomized on their hit “Black Water”), Octave One productions provide for the mind, the body and the soul. Later incorporating siblings Lance and Lorne into Octave One, the five Burden brothers have proven to be an important part of Detroit music history and indeed the greater history of techno. LWE caught up with the Burdens to ask for a potted history of the group and to find out what they’ve got in store for us in the near future. Our 80th exclusive podcast is a blazing live set recorded at The Underground in Dublin, an hour of Detroit techno that will blow your hair back and have you checking for when Octave One will hit your town. It has become difficult over the years to distinguish exactly who makes up Octave One, other than that you are all brothers. Can you please give us a run down of how you formed and the inclusion of different family members in to the group. Octave One: Octave One formed in 1989 with the production of our first song recorded being included on the Virgin/10 Records Techno 2 album. We had found out from Derrick May that our track was to be released as a single from that album and that writers were coming over to do an article and their photographer was going to be shooting pictures of us the next day. This put us totally in shock because we were just recording that track for our sake, just to have it in our collection and we didn’t even realize it was sent for consideration for that album. So we (Lawrence, Lenny, Lynell) all decided on the fly to become a group literally in Derrick May’s loft to fulfill the need of having a band to represent our song “I Believe.” Derrick was like, “What’s the name of your band?” Fortunately for us, he got called away for a few minutes after he asked us this question, because we had absolutely no idea of what we were going to call ourselves seeing that the band was just formed minutes earlier. We had the opportunity to have a quick huddle and throw some names in the air to see what stuck and settled on the name One Octave because we wanted a name that represented all three of us working in the same accord musically. But after we kept saying One Octave over and over a few times it started to sound like an old soul band other than a techno group, so we flipped the words around to Octave One. When we formed the group our other two brothers (Lance and Lorne) weren’t even teens yet, they might have been nine and six years old. They used to come in our studio all the time which we had relocated to our parents’ home and made all kind of noise with their toys, so we would throw them out. After a while they learned that if they stayed quiet we wouldn’t notice they were in there with us and they would stay and watch what we were doing. Little did we know, they were doing more than just watching when we left. Lawrence would always tell everyone when he was leaving not to touch the mixing desk because he had a mix up he was working on. And, when we would return to the studio he’d have a fit acusing us (Lenny & Lynell) of changing the levels on his mix. We mean, he would be fussing hot upset! [laughs] One day we all rolled into the studio at the same time to hear loud music coming out of it and ran into the room to find our younger brothers playing with our gear! Of course, we were shocked and upset at the same time, but none of us said a word because the lil’ guys were pretty decent! They weren’t rock stars, but you could hear their potential early on and with very little work they could turn out to be some solid producers. We would retire pieces of equipment and hand them down to them so they could have their own production set up outside of our studio. Slowly they would start adding a line or two to a track we were working on and one day while were working on a Random Noise Generation track one of their lines made it to the final mix. Before we knew it they were regulars in Octave One with the rest of us. Did you all have a very musical upbringing? What is the age gap between you all? The age gap between us (well, we hope you can keep up) from the oldest to the youngest is this: Between Lawrence, Lenny, Lynell is exactly two years and between Lynell and Lance is an eleven year gap, then there is an three year gap between Lance and Lorne. Oldest to youngest: Lawrence, Lenny, Lynell, Lance and Lorne. What were your early influences in pursuing electronic music? Wow, our early influences could run the musical map. You’re talking about five guys that all have a deep love for all kinds of music; really, all genres as long as its good. Tell us about the formation of 430 West Records and how Direct Beat fit into the label too. 430 West Records was born when were rented a studio on 430 West Eight Mile Road. Remember Eminem’s “8 Mile” movie? That was the street that separated Detroit from its suburbs. We had planned on renting the studio to start a label, but when we decided that we wanted to start one we adopted the address of the building for the label since we had already been answering the phones “430 West” anyway. Direct Beat was formed as another outlet for music from artists we really loved but didn’t think it either was the sound we wanted for 430 West or that we couldn’t release on it because of the crowded release schedule. And we didn’t want it to have any boundaries as far as what we wanted to release on it, that’s why it started on funky urban techno to acid to finally landing on electro. You’ve recorded over the years also as Never On Sunday and Random Noise Generation. Were these aliases used for slightly different sounds? Exactly! Different sounds, ideas, concepts and theories behind the music. The artwork used on some of the 430 West releases as well as the names struck at deeper issues than just releasing dance music. Can you tell us about some of the ideas you’ve tried to convey through these methods? The titles of tracks usually always hold a deeper meaning for us, but we’re not trying to convey any deeper issues to the listener, but just connecting our music with whatever idea captured us as we composed the track. For many of our releases the artwork was indeed the same, just connecting visuals to the root inspiration of the music. Many times our heritage, spiritual awareness, or general present mood finds its way into our productions, and the titles and artwork can become an extension of that. “Blackwater” was a big hit for you guys. It seems that both you and Rolando were heading towards this sort of thing (him with “Knights of the Jaguar”) after you did the “Daystar Rising”/”Aztlan” release together. What was the feeling around this time and the sort of sound you were going for? At that time we were going through a time where we were becoming a lot more in tune with the sound of Latin music. We were really getting into a very percussive-driven sound and really wanted to know if we could marry the Detroit techno sound deeper with the Latin vibe. Becoming friends with Ro introduced us deeper into a style that we liked, but soon we came to love it and really started to see a coalition of urban soul and Detroit techno. You’ve recently started the MS10 label. What is the mission for this new label and does that mean 430 West Records is no longer a going concern? to experiment. And in the future, we might open that label up to developing new artists and releasing their material on it. Technology-wise things have changed drastically since you first started producing. Is your studio very different these days? What aspects of digital vs analogue gear do you enjoy? Music production is a constant evolution. In many aspects we still do things in the same way, just with better tools. We have been using computers for sequencing and mixing for quite a while, but still haven’t warmed up to the idea of using soft synths. There are some great computer-based synths out, but we still prefer the use of machines for composing. It’s not a digital vs. analogue thing, as we use a lot of digital synths (and drum machines too), just more of a creative thing. The process of getting something special sounding out a piece of gear is still one that we enjoy. Many times the limitation and unique characteristics of the equipment is a big part of the process. Different quirks in operating systems, note and voice limits, even dirty audio pots, have helped make some of our most memorable records. Just for example, the crunchy dirty tom sound on our track “Empower” comes from a dirty tuning pot on our Roland TR-909 drum machine. We left the machine on for days and barely touched it until we got everything ready to record (which was done straight to 2-track reel-to-reel tape). On another track, “Siege,” we used a Yamaha FB-01 synth module that was multi-timbral but had limited voices. The voice stealing actually was part of the melodic development. It’s hard to get this kind of spontaneity with computer synths. You can program them to do just about anything, but sometimes you want the machine to be the machine and be a part of creation. 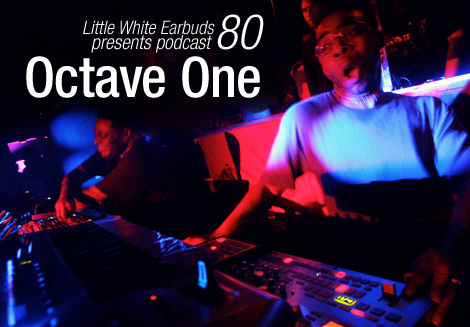 Tell us about the Octave One live show. Our live show is all hardware based, digital and analogue. Again, nothing against computers, but we like gear, plain and simple. We also don’t like the barrier that the computer screen puts between us and the audience. Our live show is about interaction and bringing our music alive (not just live) to those we are privileged to play for. When we decided to put together a live show, we tried to conceive something we would enjoy experiencing. One thing that is sometimes missing in many live electronic music shows is the connection with the “show” aspect of it. We allow ourselves to get lost in the music and strive for a synergy with the audience. Whether it be a small club or large festival, it’s very important for it to be a unique and intimate experience. Something we collectively share with everyone in attendance. The Revisited Series will introduce you to younger audiences who perhaps hadn’t heard of you much before. Do you have further releases planned for this series? The series is a milestone of sorts for us. We wanted to hook up with some of our friends and music producers we admired and ask them to choose a track from our catalog to remix to help us mark our 20+ years in electronic music. We got some really cool responses from some very special people, and the Revisited Series was born. To go along with the Sandwell District and Aril Brikha remixes, we’ll be continuing the series with remixes from Luke Slater, Cari Lekebusch, Ken Ishii, Alexander Kowalski, and Vince Watson. Later this year we will also be compiling all the mixes with previously released mixes by Los Hermanos, Alter Ego, and others for the Octave One respective album, Here, There, and Beyond. Tell us about the mix you have done for us. Since we are a live band, we’ve chosen a live set from one of our favorite cities to play, Dublin, Ireland. It was recorded late in 2010 at a cool little affair called The Underground. We play some classic, new released, and special unreleased tracks. It gets wild sometimes, but it’s live baby. This is not a DJ set. No MP3s, CDs, or even vinyl records were harmed during the making of this podcast. Synthesizers, drum machines, samplers, and effect units were used to bring this recording to life. You can even hear the crunchy toms of “Empower” on it! Hopefully you can get a bit of the feel of what the live show is like. We hope you enjoy it. What can we expect from Octave One in the next year? More touring including special shows with Ann Saunderson on vocals, a new album later in the year, and a few special collaborations are in the works. All-in-all, just enjoying ourselves playing music. What a treat – I think it blew my hair not just back, but off ! Huge thanks to O1 and LWE. This is so good and reminds me loads of when they came to Leeds. Bigup!